Think of a WooCommerce Grouped Product page as a container that holds, or links to, a collection of simple product pages. You can only add simple products to a grouped product page. You can NOT group variable products. What kind of products would you group together? Music tracks are a good example. You could have a WooCommrece Grouped Product page that lists and links to the individual tracks in an album. The shopper could buy just one of the tracks or buy the whole album. By the way, have you considered building your shop on one of the StudioPress themes that are now WooCommerce enabled? They look great. You could also group together a main product with extras that the shopper might like to buy. The important point to remember is that you can only group simple products. You can NOT group variable products. So things like clothes that have size and color options can not be added to a WooCommerce grouped product page. How do you make a WooCommerce grouped product page? That’s all you really need to do to make the grouped product. Make sure you save your changes. However, so far your WooCommerce grouped product page does not link to any other products. 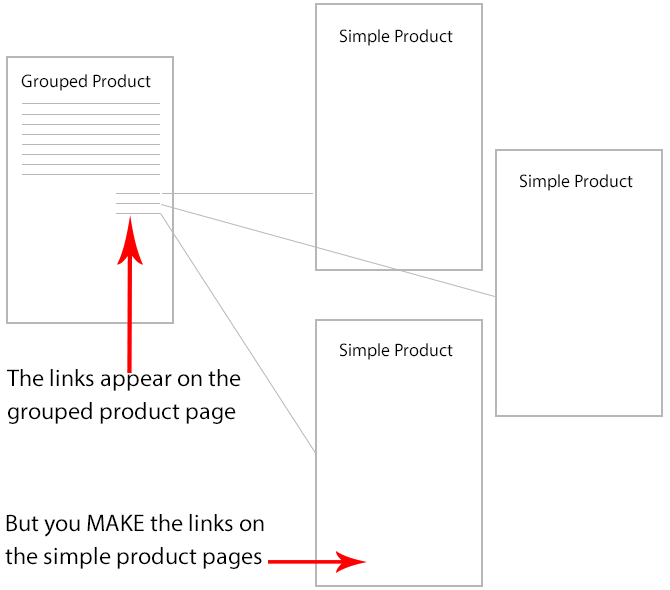 The linking occurs on the simple product pages, then WooCommerce automaticaly adds the link to the grouped product page. Make a set of simple products in the normal way. In each simple product, click each tab in the product data section and fill in all of the necessary information. The tabs are General, Inventory, Shipping, Linked Products, Attributes and Advanced. How do you link your simple products to the grouped product page? When, on a simple product page, you select a grouped product from the drop down list. WooCommerce automatically adds a link from the grouped product page to that simple product page. You now have a grouped product page that lists and links to the individual simple products you selected. The link appears on the grouped product page. But you MAKE the link on the simple product page.